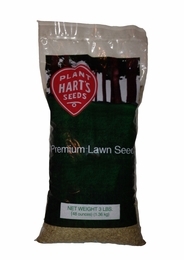 Evergreen is Hart's fast establishing Sun and Shade Mixture. Perennial grasses with a turf-type ‘nurse’ ryegrass that will help stabilize the soil while the other grasses get established. Needs a half-day of sun to thrive. A good lower maintenance blend. Creeping Red Fescue (50%), Transist Intermediate Ryegrass (30%), Kentucky Bluegrass (10%) and Chewing Fescue (10%).